We’d love your help. 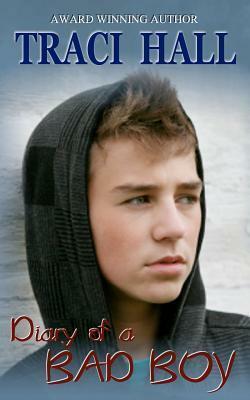 Let us know what’s wrong with this preview of Diary of a Bad Boy by Traci Hall. To ask other readers questions about Diary of a Bad Boy, please sign up. Normally when I get my "free reads of the day" email, the books are put into sections. Romance, youth, drama, Christian books and so on..
And I'm not scared to admit that I would never read a book from the 'Christian' section.. Much respect and all that, just not my style.. Thats why I feel a little cheated, 'cause this is most defo a 'Christian Youth' book.. When I started reading this book I didn't pay attention at another review saying the book it's a Christian book. I am OK if the book doesn't try to be preachy, which was not the case here. The storyline was interesting, and I liked the first part of the book when the characters were believable. However, as the story progressed the more I felt disconnected from the characters. Josh has an abusive father and he does what he thinks is right in order to survive. He is full with anger and he makes bad choices. This part was very well written and I really liked it. But when Josh goes to Shining Star Boy's Ranch and everybody started preaching to him, he accepts everything, without questions almost immediately! Oh well, I don't believe this! Take any trouble kid from street and talk to him like in this book and see if he reacts like Josh .... and in such a short time! This one surprised me, for the good. As others have stated I think I would not have given it a try if I'd known upfront it was Christian fiction because it seems Christian fiction is too pushy and doesn't deal well with stories. But in this case it does. I downloaded it as a Kindle freebie and I was attracted to the tittle as I was trying to write a sort of "bad boy" of my own for a story. Wanted to see how others dealt with it. But Josh isn't really a bad boy. He is misguided and misunderstood This one surprised me, for the good. But Josh isn't really a bad boy. He is misguided and misunderstood boy but he is fiercely loyal to his friend and has good intentions mostly. Though he has had to defend himself ever since his mom died. I liked how he developed though I might have delayed a bit more his breakthroughs. I get a book needs to advance the plot otherwise the readers become stalled, but at times it seemed that this was too quick even. I enjoyed this free Kindle ebook more than I thought I would. Josh had surprising depth as did most of the characters. Nobody was completely perfect or totally evil which was nice. Also, you could see where people were trying to do better but not always succeeding. Based on my experience with children/teenagers struggling with these issues, the author described the environment and experiences Josh was going through well. I was surprised by the inclusion of so much "God" talk, and I was afraid at I enjoyed this free Kindle ebook more than I thought I would. Josh had surprising depth as did most of the characters. Nobody was completely perfect or totally evil which was nice. Also, you could see where people were trying to do better but not always succeeding. Based on my experience with children/teenagers struggling with these issues, the author described the environment and experiences Josh was going through well. This is an amazing young adult book. Josh has some serious teenage issues that he has to deal with, and Traci brings him to the edge of mistakes, only to have him find redemption in the end. One great story. Did edge into preachy on occassion and there were quite a few eye-rolling moments but there was a fair amount I enjoyed too- some very touching scenes.